The eleventh longest river in the world, and one of the longest in all of Asia, the Mekong is certainly the most important in ex Indochina. The famous river starts in Tibet and, after crossing more than 4,000 kilometers through six countries – China, Myanmar, Thailand, Laos, Cambodia and Vietnam, it empties into the South China Sea. 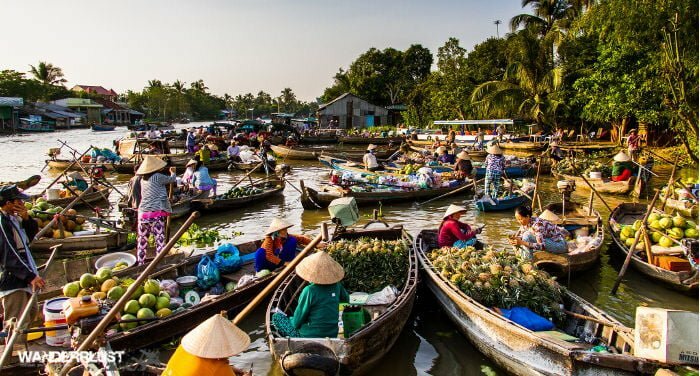 The Mekong is called “Cuu Long Ciang” by the Vietnamese, or the “River of the Nine Dragons”, a definition of the eight estuaries of its delta. After doing some reading, I discovered that the number eight is an unlucky number in Vietnam, and for this reason a dragon was added to its definition.